Quantum computing, nanotechnology and genetic engineering are exciting fields. But understanding the interaction between the Sun and Earth is at least as important as a scientific frontier. For example, one of the world’s most prestigious science labs has just demonstrated that cosmic rays affect cloud formation – which in turn affects climate – on Earth. Because the sun’s output directly determines the amount of cosmic rays which reach the Earth, the sun is an important driver of the Earth’s climate. Intense solar activity can destroy ozone in the Earth’s atmosphere, thus affecting climactic temperatures. See this, this, this and this. Indeed, the effects of solar energy on ozone may be one of the main ways in which the sun influences Earth’s climate. There is even an outside chance that this unexpected effect is brought about by a previously unknown particle emitted by the sun. “That would be truly remarkable,” said Peter Sturrock, Stanford professor emeritus of applied physics and an expert on the inner workings of the sun. If the mystery particle is not a neutrino, “It would have to be something we don’t know about, an unknown particle that is also emitted by the sun and has this effect, and that would be even more remarkable,” Sturrock said. Scientists … have proven that sounds generated deep inside the Sun cause the Earth to shake and vibrate in sympathy. They have found that Earth’s magnetic field, atmosphere and terrestrial systems, all take part in this cosmic sing-along. It’s an apt analogy because “the total energy in a spacequake can rival that of a magnitude 5 or 6 earthquake,” according to Evgeny Panov of the Space Research Institute in Austria. Some allege that spacequakes cause actual, physical earthquakes on Earth. I have no idea whether or not that is true. However, the poem may use artistic license rather than scientific rigor. 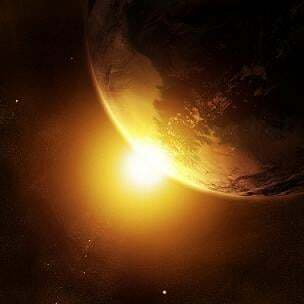 When scientists understand all of the ways that the Sun and Earth interact, we will know alot more about the Earth and our place in the universe than we do today.